Take hourly breaks – Every hour, get up and go somewhere; furthest restroom, the photocopier, water fountain, colleague’s desk… Just move! 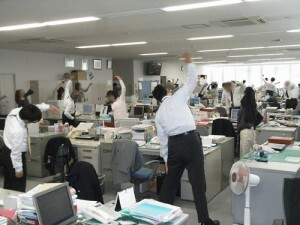 Okay, so if you’ve nowhere to go, touch your toes, do some star jumps or something, who cares what your colleagues think! Take a meeting on the go – Have a brainstorming session scheduled? Do it while you walk, get those endorphins moving and fire up that creativity. Avoid elevators and escalators – Unless you work on the 39th floor, elevators are your enemy! Get a pedometer – Set yourself targets or have competitions with your boss! See who can clock up 10,000 steps first. Ditch the car – We know it can be a lifesaver blasting some music on the way home, but surely you can do that through headphones? When possible, walk, bike, or even run to work! Or just park a few streets away. Wake up earlier or get home later – Either get yourself moving before the rest of the world wakes up, or stop off at the gym on your way home if you’re not a great early morning person! Plan your schedule – Write down your meal plans and stay on top of a fitness schedule. More importantly stick to it! Set alarms – Remind yourself to get up and move every hour or so, it’s easy to just work through things when you’re on a roll. Don’t roll! – Wheelie chair? 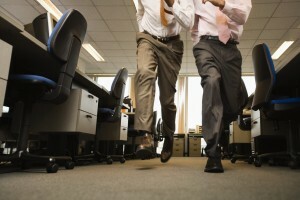 Don’t roll from different corners of your office to file papers or reach the stapler… Stand up! Try standing when you take a phone call too or take a walk if it’s a wireless phone. Tupperware for the win – If you have leftovers from a reasonably healthy meal one night, bring it to work with you, or pack yourself some healthy snacks. Stay away from the vending machines though. And those doughnuts that always appear, just say no! 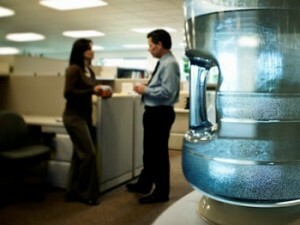 Hit the water – Get yourself a reusable water bottle and drink one full bottle before lunch and one before you go home. Drinking will help keep you fuller, less likely to snack, and less likely to experience headaches. And try substituting herbal teas for coffee when you can too. When you think about it, there are loads of neat tips and tricks to make sure you don’t get square eyes and numb behinds when sitting at a computer all day, it’s just having to motivation and determination to do them and stick to them! Maybe try it for a week or so and see how it goes!